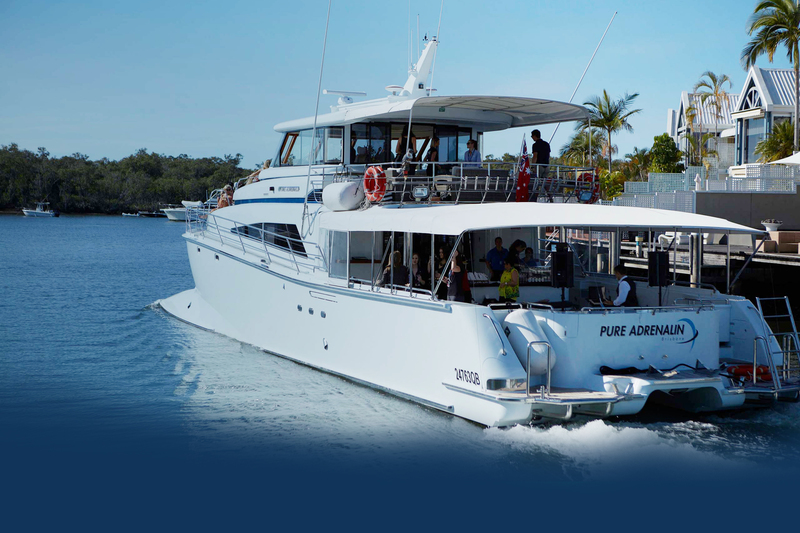 Welcome to Pure Adrenalin, a luxury charter vessel specialising in exclusive luxury charters along the East Coast of Australia. We are is based in Brisbane and operate on the Brisbane River, Moreton Bay, Tangalooma and Gold Coast. A custom designed 27m (90ft) wave-piercing catamaran, Pure Adrenalin is unique vessel that is especially suited to cocktail functions, Christmas parties, corporate events or just an exclusive party. With two large decks able to house up to 76 guests (depending on location), Pure Adrenalin is the perfect venue to take your next event to the next level. Our friendly and experienced staff can help you customise your charter experience from choosing locations, catering and beverage packages to suggesting activities depending on where your charter is located. Once booked, our experienced crew and hosting staff take over to ensure that every aspect of your charter is managed to the highest possible standards.